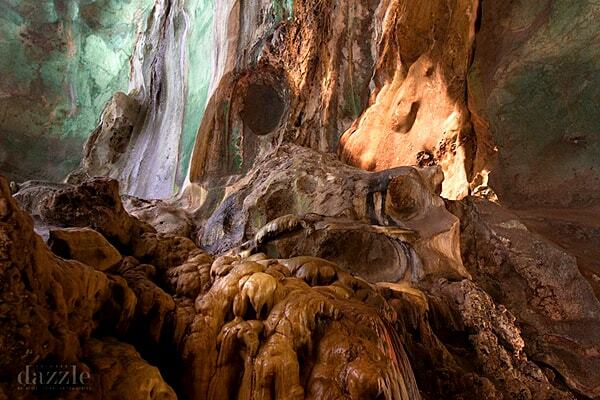 Have you heard about the Jade Caves of Sarawak? 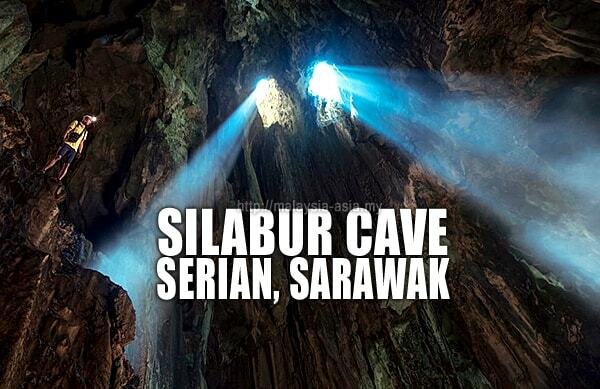 Yes, a cave that looks like it is made from jade, which is called the Silabur Cave in Serian, Sarawak. This beautiful cave has been around for a very long time, and mostly visited by researchers, but in 2016, the cave became more popular among the locals, mainly due to the beautiful jade texture of the cave walls. This beautiful cave is found in the district of Serian, which is about 90 minutes drive from the city of Kuching in Sarawak. 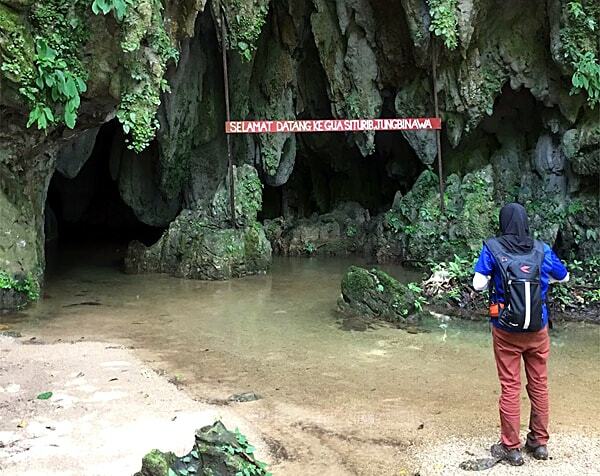 Currently as I write this article, there are no commercial tours that bring you here, but you can request from some of the adventure travel agents in Kuching for trips to Silabur Cave. Overall, a trip here would take you half a day to a full day, and to explore the cave area, it will take you roughly around four to five hours. 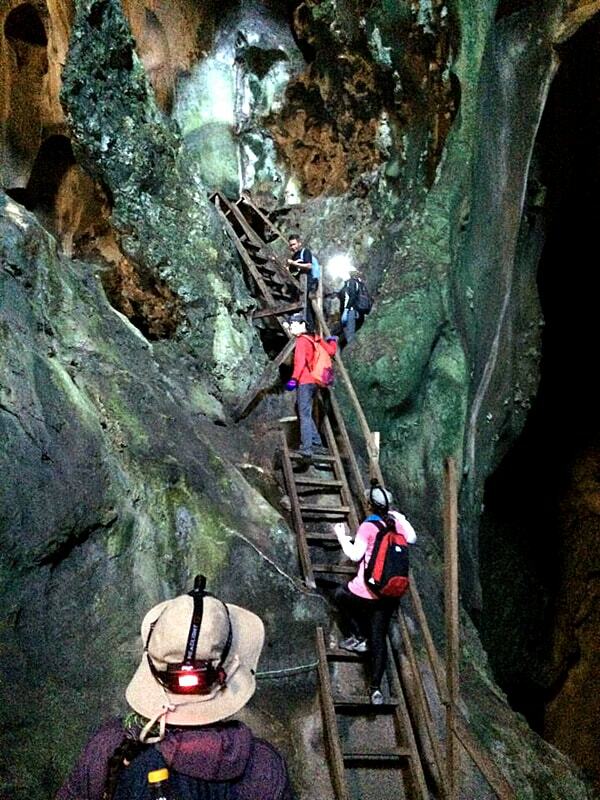 The entrance of the cave is about one hours trek up the hill, and located in the middle of Mount Silabur. Be prepared for a medium level hike up here. From the entrance of the cave, it will take you another 15 minutes before you reach the main cave chamber, which is called Labak Tirason. 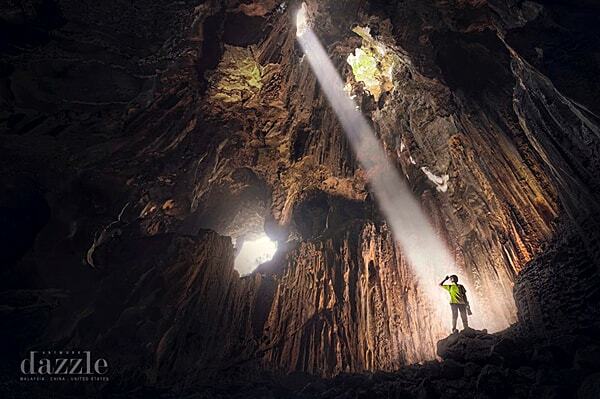 One of the photographers pose inside the cave. Photo by Paul Sarawak . What is Silabur Caves? 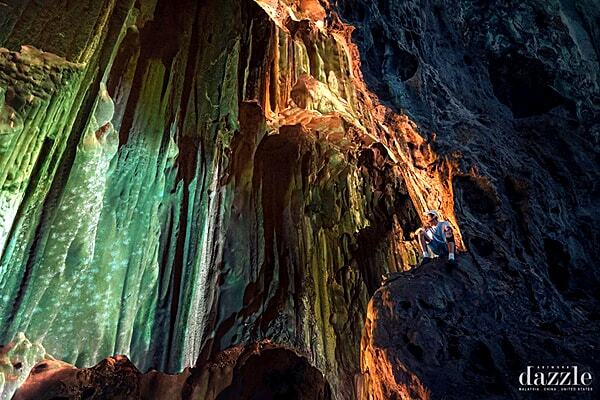 Silabur Cave is a limestone cave that is located inside of Mount Silabur, and offers vertical cliffs. From the village, it is a one hour trek to the foot of the mountain. From the foot of the mountain, you then need to trek up halfway which is roughly another hour before you reach the entrance of the cave at the mid of the mountain. These caves have been long harvested for the prized birds nest from the local swiftlets. A local association operates and manages the caves here, where bird next harvesting takes place a couple of times a year. Most of the harvested Silabur bird nest is processed and exported to China, and very little is sold to the locals. Inside the beautiful cave at Mount Silabur What to do in Silabur Caves? A cave is always a cave, and there are very limited things one can do here. 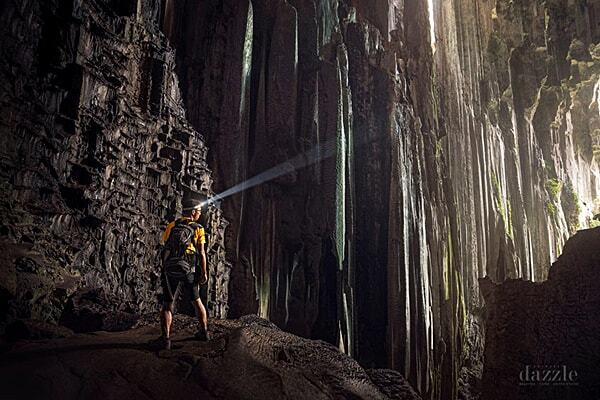 In most cases, those who are into caving or cave exploration will find this place quite fascinating. Probably due to the overall jade coloring inside the cave, it gives a beautiful color tone versus the general dark grey colors. 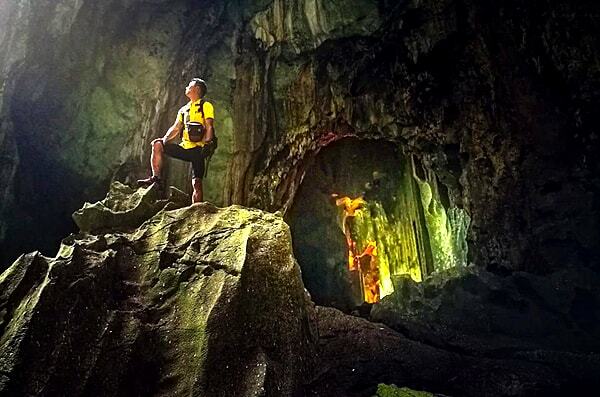 Some people have actually gone into the cave to do some photography, and then shared the images on social platforms, which has now created interest among the locals around Kuching and also Sarawak. 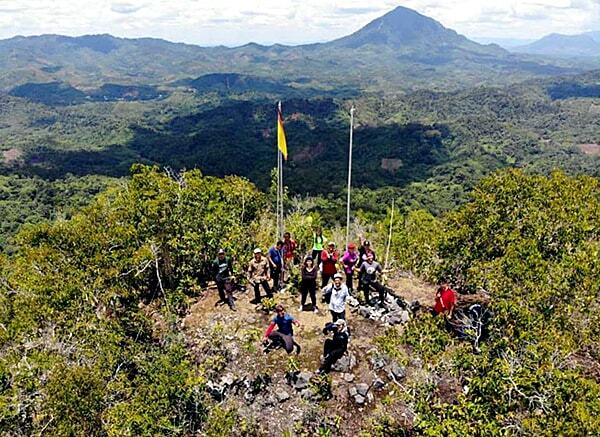 A the top of Mount Silabur is a peak called Sky-Park which is about 400 meters, where most visitors will also trek or climb up to this peak. The view is not too bad at Sky-Park, and is recommended for outdoor lovers. Nearby, there is another underwater cave called Siturib Cave, where clear cave waters are waist or chest high. You need local guides for both of these places. Read at the end for more info. A famous Sarawakian female sape artist called Alena Murang has also created a short video of herself singing inside the Silabur Caves, which has been viewed over 1,400 times. Alena Murang is part Kelabit, and is one of the up and coming Sarawakian sape musicians that has created an interest among today's music lifestyle. She has performed all over the world, and her video in the Silabur cave has also created a lot of interest from the locals about the location. 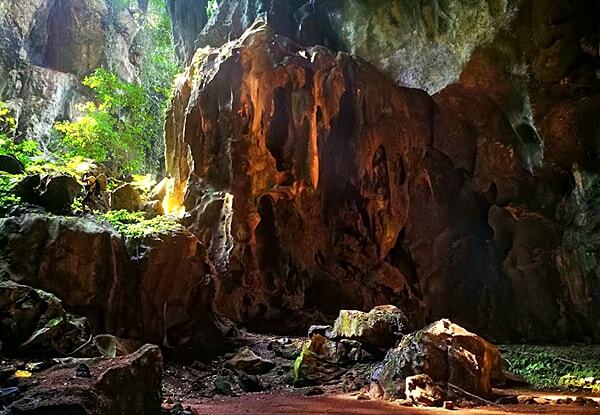 Along with many other caves in Sarawak, there are always folk legends connected to these places, and some of them are pretty interesting to know. A long time ago, the local Bidayuh people here celebrated the harvest festival once every year. On one harvest festive celebration night, there was an old man who lived in the village. The old man has one grandchild who stays together with him. For the kids parents are nowhere to be found after they went out for food, some say they were killed by the head hunters, and some say they were eaten by animals. On that festive celebration night, the old man was eating Kasam Ikan (a local delicacy where they marinade the raw fish with rice and salt, put it in a tight jar, leave it in a dark corner for a month or so and eat it), but one of the village people mixed the fish with the rubber tree fruits to play a joke with the old man. The old man eventually ate the rubber fruits, and got laughed by the village people. And the old man then called his dog, and he tied a bell on the leg of the dog, and asked the dog to bark at the village people. The dog starts chasing after them, and due to the bell, the old man will know the where his dog is from the sound. But all of a sudden the sound of the bell is gone, complete silence. The old man keeps on calling the dog to come back, but it never returned. The old man cried, and while was crying, it started to rain, and a weird thing happened where it rained rocks instead of water drops. The rain became heavier, and soon when they knew it, the rocks had then formed the mountain, and also the cave. Below are some beautiful photos of Silabur Caves, taken by Paul Sarawak and his group, when they visited in August of 2017. The photography skills of this team is awesome, and you can see from the photos why. 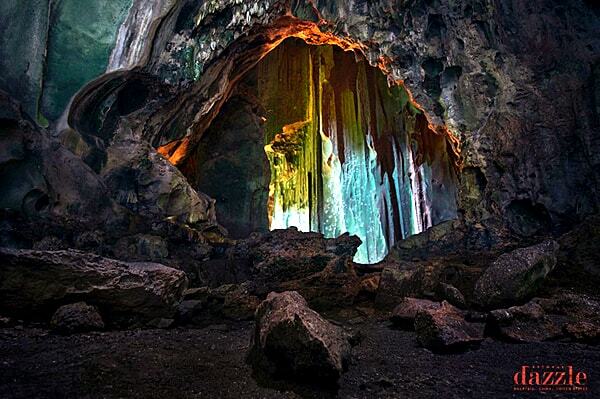 Have a look at them, and tell me you do not want to visit these caves? If you plan to do so, read the end of the article where details on how to go there and so on is shared. 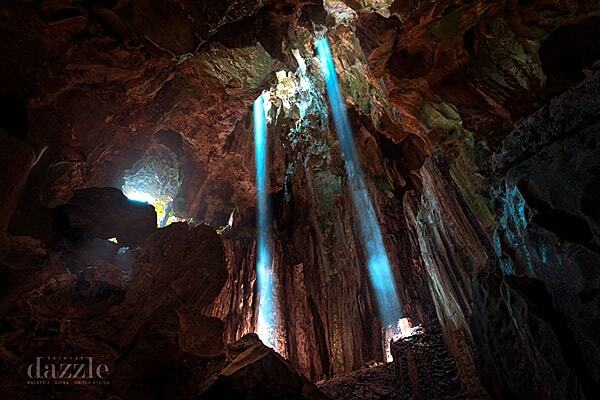 Light falls through the cave ceiling onto the floor. Photo by Paul Sarawak. Photo of the cave mouth. Photo by Paul Sarawak. Interesting cave formations inside. Photo by Paul Sarawak. A caves sits for some cave photography. Photo by Paul Sarawak. Beautiful combination of cave flora and lights. Photo by Paul Sarawak. A caves poses by the Jade Cave. Photo by Paul Sarawak. 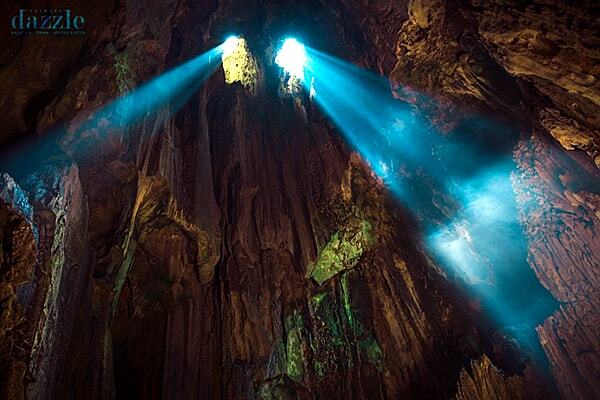 Light shines through openings in the cave ceiling. Photo Paul Sarawak. All photos are from the Paul Sarawak and team Facebook Page, unless stated under the photos. Gua Silabur is located just out of Kuching City, in the district of Serian, and is located near the town of Tebakang. It is about 90 kilometers from Kuching, but because of the small roads to get here, it will take you around two hours drive one way. The caves are also located close to the Kalimantan border, which is only about five kilometers distance. This part of Kalimantan Indonesia is known as the Sanggau Regency of West Kalimantan. The closest Malaysia-Indonesia checkpoint to Silabur Cave is the Tebedu Immigration Complex, which is also a popular place for both countries. For those into some serious adventure caving, there is also another cave in the area which is called Siturib Cave or Gua Siturib. This is a water cave, where you need the local guides to bring you in the waist or even chest deep waters. Anyone going into the Siturib Cave will guarantee to get wet, so come prepared for this. You should also arrange this with your cave guide, who will be the locals from the village area. They know the caves by the back of their hands, which is vital to anyone entering this water cave. This is the top of the mountain, where many visitors will also trek or climb up since they are here. A trek up to Sky-Park will take you about three hours, and is a medium level trekking. For those interested in doing this, you must engage the local Silabur guides, as they know the place inside out. The thrill about the trek up Mount Silabur is enjoying the amazing view of the area from the peak here. Usually, it would be better to start with the trek up, and then visit the caves. However, you can ask your local guides about this, and which is easier done. If you plan to do both trekking and caving, then you will require a full day here. How to go to Silabur Caves? If you are in Kuching, you can ask some of the travel agents in town, as they would know who organize trips to Silabur Caves. However, this is not guaranteed. For those who plan to explore by themselves, you can easily drive to Silabur Cave on your own, with your friends. Please do not go by yourself, as visiting caves is best done in a small group. The best way to go to Silabur Cave for travelers is to rent a car and self drive there. There are directions on Google Maps which make your drive here easy. Once you reach here, you can contact the local Silabur Cave Association to make arrangements. The contact is below in a photo. First, you need to head to Serian town from Kuching, which is about 90 minutes drive with mild traffic. I would recommend using Google Maps or Waze to do this. After you reach Serian, head to Tebakang town, which is another 15 minute drive. From the main Jalan Serian-Tebedu, you need to turn off at Kampung Tebakang. Here, there are two villages, known as Kampung Tebakang Dayak, and Kampung Tebakang Melayu, which are located one after the other. Once you enter this village, you need to drive about 20 minutes until you reach Lampung Lobang Batu, and then look out for SK Lobang Batu, then look for a sign that turns right into the Gua Silabur or Silabur Cave. After you turn into that road, head towards Kampung Batu Lin and Batu Mawang, which is about 1.5 km inside. Batu Lin is also a Bidayuh village, and there are sign boards showing the village name. Do ask for directions if you are unsure as the locals are very helpful in this part of Sarawak. 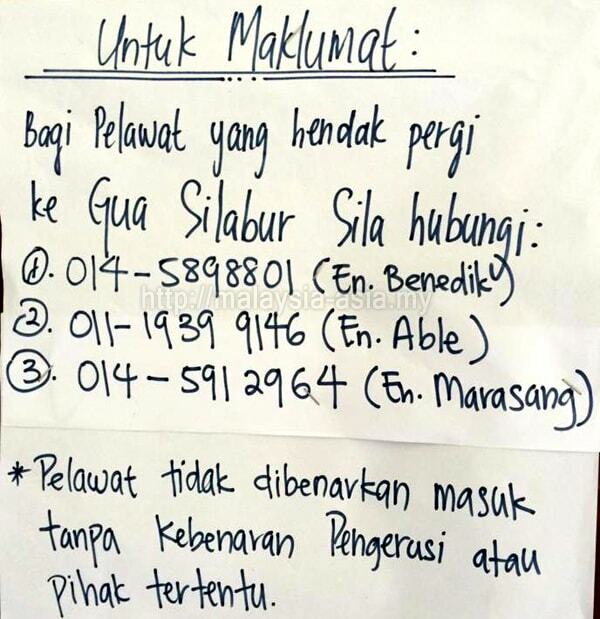 There is an entrance fee of RM10.00 per person paid at the foot of Mount Silabur, to the Silabur Association. The cave is also managed by the local Silabur Birdnest Operator Association. Local tour guides for the caves are available at RM50.00. The main office to do your booking is at the village closest to the caves. There is a small office there, and you can ask the locals when you are there. I would recommend you contact them from the numbers above to make an appointment. If you have a thing for caves, and is visiting Kuching in Sarawak, I would make the Silabur cave a place to explore and visit, as it is not too far from Kuching City. You will most likely do a morning trip here and be back in Kuching after lunch, hence it is less than half a day to spend. However, if you are heading here for some photography, make sure you come prepared, and just like any other cave in Sarawak, one should always be cautious when walking in the caves. 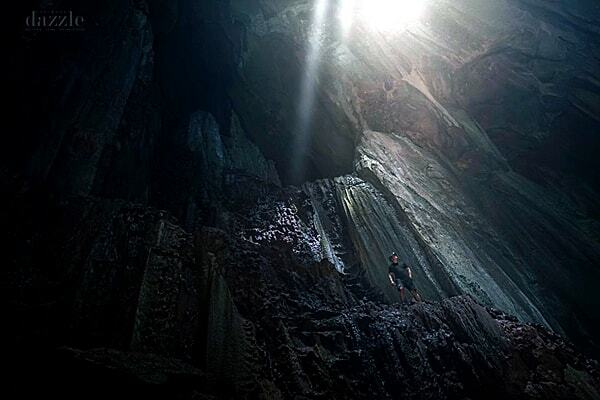 Take a look at some of the other caves in Sarawak and Sabah , which I wrote about many years ago, if you are interested in visiting the others. I write this article about the Silabur Caves in Serian, based on the Visit Sarawak Campaign, which is in 2019, and the objective is to promote the other places of Sarawak, with a tagline of Sarawak More To Discover.